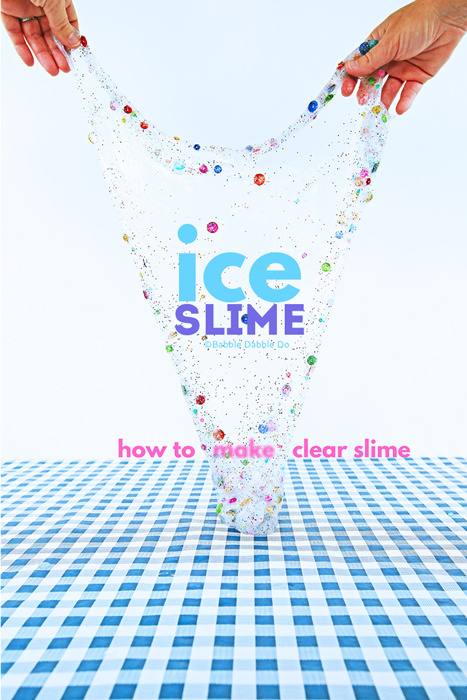 My daughter and I have tried countless slime recipes over the years and the one that has been hands down the trickiest to get right is figuring out how to make clear slime. 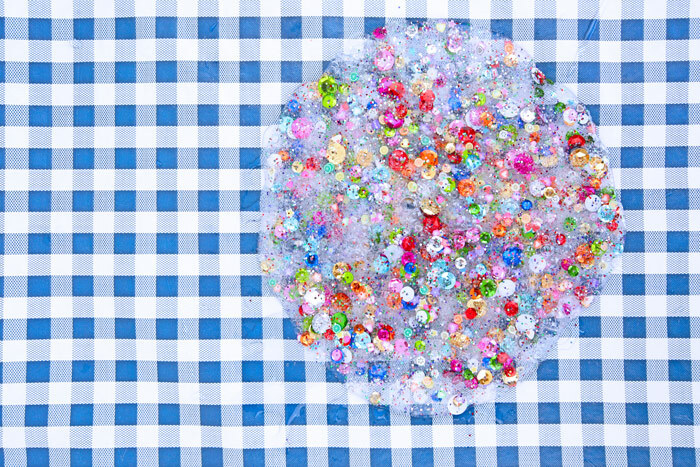 Clear slime is incredible looking, it appears like liquid ice and showcases little colorful sequins and trinkets like no other slime. The problem is it’s really hard to get right. At my workshops and birthday parties, I’ve had kids tell me over and over again that their clear slime making was a total fail and they were excited to learn how to make clear slime that worked for once! Here’s the thing, clear slime is hard to make, if you over activate it, will be brittle and if you under activate it will be really sticky. I tried a number of different recipes before finding this one on YouTube which I used as the starting point for our recipe. I made a few modifications after doing a bunch of testing to make it a little more fool proof. 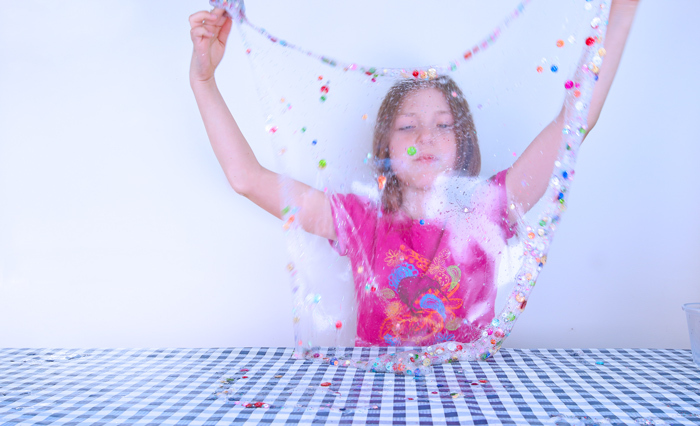 And I figured out the trick to getting your clear slime stretchy again so read on! Clear Glue The best deal is buying it in gallon sizes on Amazon. You will not find it in stores for this price! Saline solution Buy generic saline solution at the drugstore. Make sure it contains boric acid. 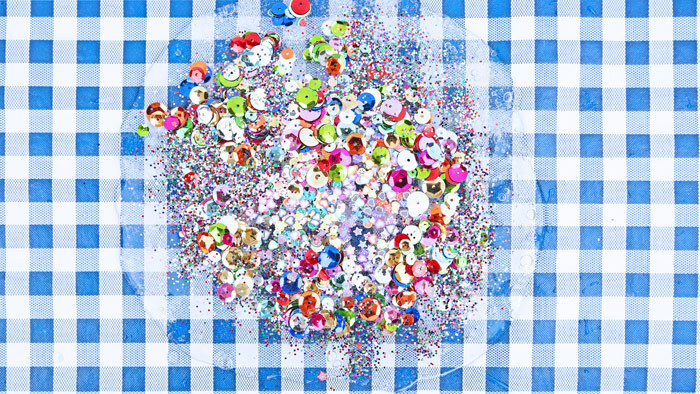 Add-ins like these sequins, foam beads and these polymer clay decorations. Plastics storage containers These ones are really fun to store small amounts of slime in. Step One Combine 4 oz. of glue, 2 oz. of cool water, and 1 tablespoon of contact lens solution in a mixing bowl. Mix very slowly for about a minute. Step Two In a separate cup, mix 4 oz. of warm water with 1 teaspoon of baking soda. Stir until baking soda is completely dissolved. 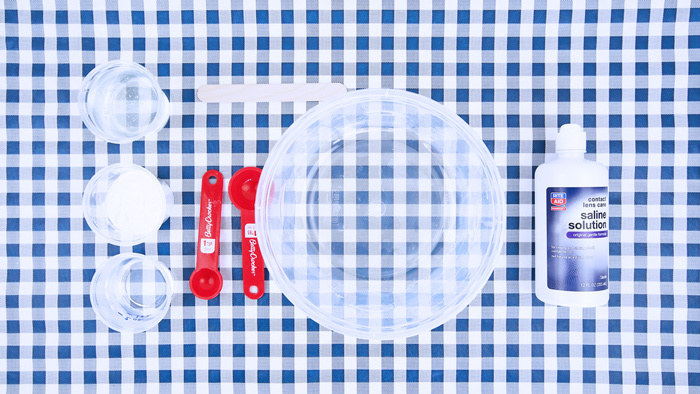 The warm water will help dissolve the baking soda and make the slime stretchy. Step Three Carefully pour the baking soda mix into glue mixture. Stir very gently for about a minute trying to avoid making bubbles. Step Four Let sit undisturbed for 5-10 minutes. THIS IS AN IMPORTANT STEP! It really helps the ingredients gel. Step Five Now go test your slime. It should pull out of the container. It will be sticky! Gently knead it briefly to continue activating the slime. If it is still very watery add a few more drops of contact lens solution to help activate the slime a little more. Be judicious though! This slime tends to thicken over time so I only add extra saline solution if the mixture is extremely watery. Otherwise a little gentle kneading should bring it together. Step Six Time to decorate! Add in little bits and bauble like: sequins, foam beads, and these nail art decorations look incredible in clear slime! Pay attention to the water temperatures! Be sure to use cool water in step one and warm water in step two. 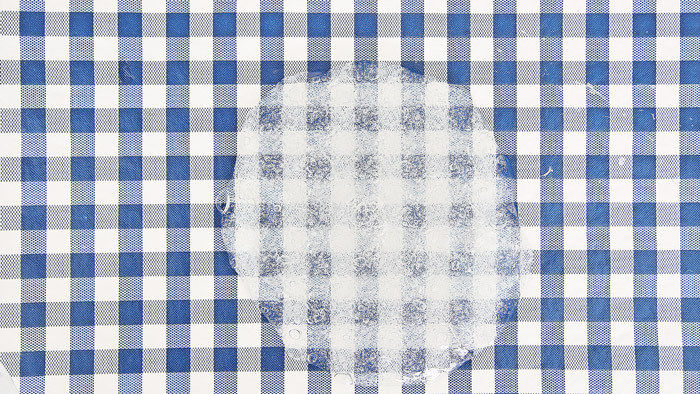 Clear slime is pretty susceptible to temperature variations. Too much warm water and the slime won’t gel, too little and it will be stiff. Don’t over stir! Too much stirring will cause air bubbles to form and the slime will appear milky for a few days. Use craft sticks to stir. It’s a lot easier to stir slowly when using a craft stick. 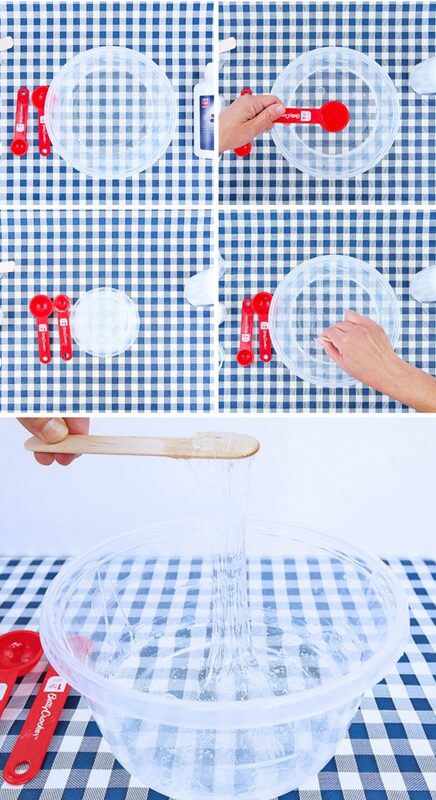 Spoons invite kids to stir quickly and this slime will get filled with bubbles if stirred too fast. Don’t add too much activator! 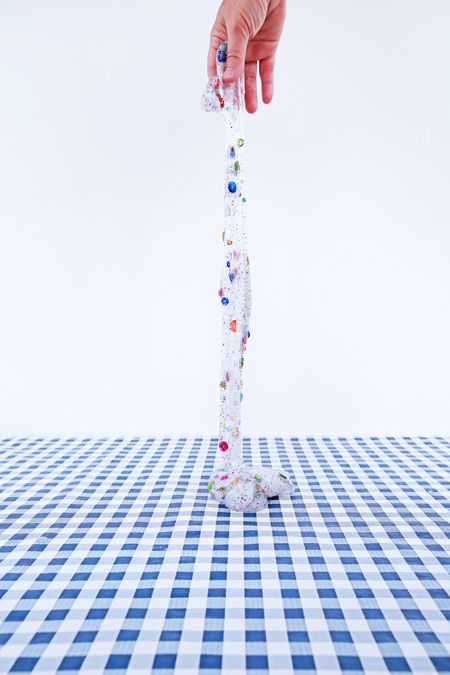 Clear slime is much more prone to getting stiff than slime made with white glue. It’s better to err on the sticky side than over activate this slime. Pull it apart slooooowly. Remember that clear slime is inherently less stretchy than white glue slime. Pull it apart more slowly and you’ll find that it is stretchier than you think. The impulse is to treat it like white glue slime and pull it apart quickly but that does tend to cause it to break and you’ll think your slime is ruined. Instead try again pulling it apart very slowly and see what happens. You can also try our secret to making it stretchier below. Try these containers to store your slime. 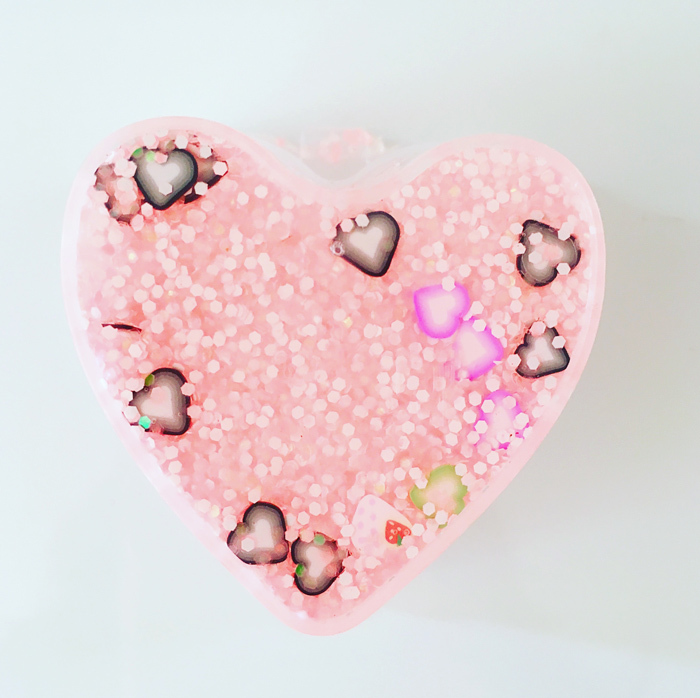 We’ve made this slime for parties and workshops and it’s a fun idea is to trade clear slimes with friends by putting a small amount of your decorated slime in these mini containers. 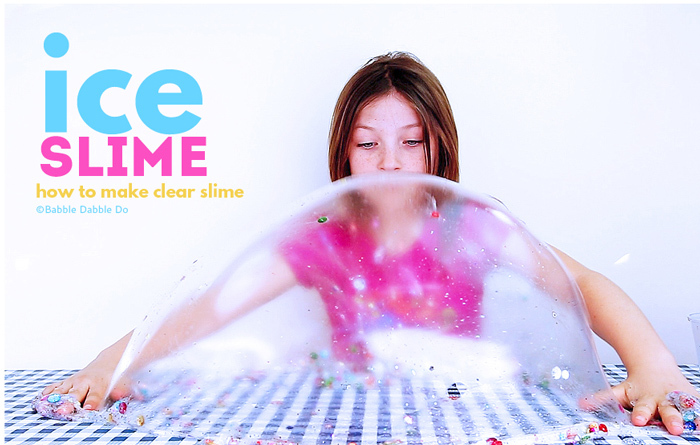 If you have ever played with clear slime you know that it really easy to make it stiff by adding too much activator. And after it sits for awhile it can also get stiff and break apart easily. I googled how to make it stretchy again and tried every single method to no avail (that includes warm water, microwaving it, adding hand sanitizer, hair gel, lotion and more glue). Finally I found the solution to make it stretchy again and it’s based on the science of slime (see below): Heat! My preferred method of warming up slime is good old fashioned sunlight. The colder clear slime is the more brittle it becomes. So warm it up by letting it sit in a clear container in direct sunlight or under a warm lamp for 10-15 minutes. Bam! Your slime will be stretchy again provided you didn’t over activate it in the first place. Note: Lotion will work as well but your slime will become really milky and lose that lovely icy look. 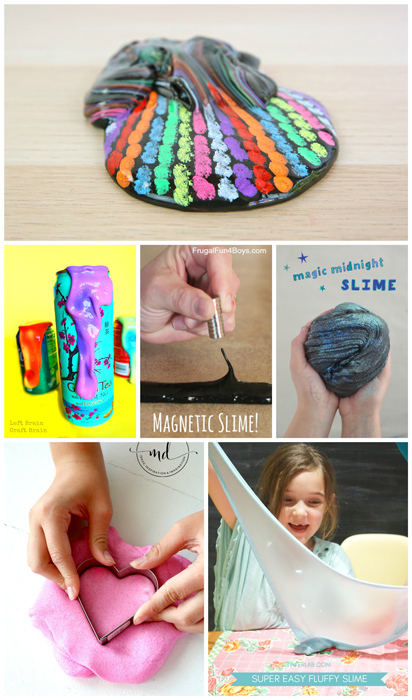 A lot of folks are quick to dismiss slime as a trendy, very messy activity that kids are obsessed with. Many parents have rolled their eyes (including me) when trying to clean up yet another trail of slime that leads to the bathroom sink but here’s why you should be thrilled your kids love slime: There is a ton of science in slime making! Viscosity is the measure of friction in a liquid and determines how fast or slow a liquid flows. Water has a low viscosity and flows quickly while liquids like slime, corn syrup, soap, and molasses have a high viscosity and move slowly. Viscosity is affected by temperature. The warmer a liquid is, the more apt it is to flow quickly, cool it down and it flows very slowly or even stops. This is one if the reasons why the warmer your slime is the more stretchy it becomes! Slime is an example of a non-Newtonian fluid, a term for a liquid whose viscosity changes depending on pressure. You can form slime temporarily into a shape but let it rest and it becomes a pool of goo. Non-Newtonian fluids also behave differently when stress is applied to them. Shear thickening describes a behavior where a fluid’s viscosity changes when a stress is applied. A shear thickening fluid acts differently depending on how you handle it: Pull on it quickly and it breaks apart, pull on it very slowly and it stretches. Clear slime is a really good example of this because it exhibits this behavior more than white glue slime. Glue is a polymer. A polymer is a substance made up of a long chain of molecules that repeat. These chains are able to slide past each other making the glue flow. Saline solution contains boric acid and sodium borate- which are derived from a natural substance called borax or sodium tetraborate. When mixed with glue, the borate ions crosslink with the glue’s protein molecules, making them larger molecules that can no longer easily slide past each other. Did you realize there was so much science in slime??? ?